This page details Type 3 of the voice evacuation installations. 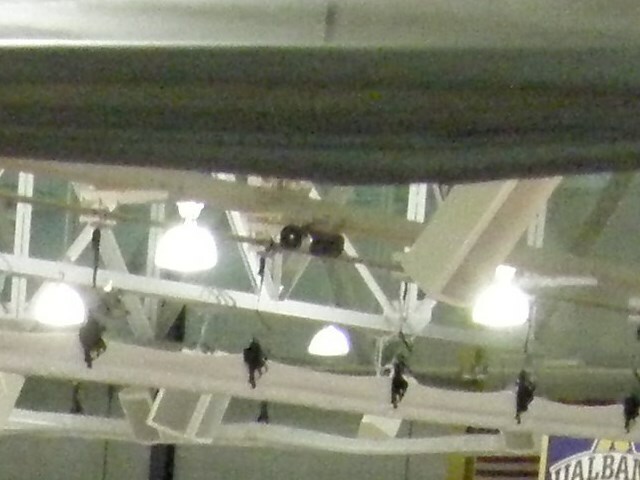 This type of installation can be found in the SEFCU Arena on campus, which was built around 1992. Again, this setup is a bit different from the rest of the buildings. These are the smoke detectors installed. The first one is model 2098-9201. The second one is an unknown model, however it is a beam detector. The third picture is also a beam detector (System Sensor model BEAM1224), however, unlike the first one where it relies on a receiver to be at the other end, the second one simply requires a reflector (seen in picture 4) to reflect the beam back to the detector. Finally, these are the pull stations installed. They are Simplex model 4251-20 T-Bars. Some of them can be found under Stopper II stations so that people won’t pull them maliciously. It is unknown if the voice evacuation sequence is the same in this building as in the other buildings, although it is a possibility. And that’s Type 3 Voice EVAC!